Did you know there’s a new television network with scifi programming? Well, there is — it’s COMET TV and it’s FREE! Some highlights for November are Return of Dracula (1958), Witchboard (1987), Mac and Me (Jennifer Aniston’s 1988 film debut… as an uncredited extra! ), Red Planet (2000, starring Val Kilmer), Die, Monster, Die! (1965), and the television series Dead Like Me. In honor of this month’s programming, we’re giving away a COMET TV Swag Box that’s filled with t-shirts, snacks, and more. (2) Two COMET Exclusive Shirts: One – Get Skiffy “T” and the ‘We Can Hear You Scream’ Alien T.
The Gold Box spotlight deal of the day over at Amazon today is Dead Like Me: The Complete Collection on DVD for only $29.99 (that’s 57% off the list price of $69.98). 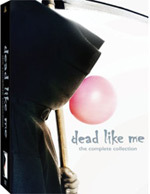 This collection includes both seasons of the former ShowTime series, as well as the more recent direct-to-DVD sequel Dead Like Me: Life After Death. This release also comes with deleted scenes, cast commentary, and a photo gallery, as well as a behind-the-scenes featurette. There’s also “The Music of Dead Like Me,” “Dead Like Me…..Again,” and “Putting Life Into Death” featurettes. Created by Bryan Fuller, this series centers on George (Ellen Muth), an 18-year-old girl who dies and becomes a grim reaper, where she helps the souls of newly dead move on to the afterlife, though she is stuck in this world unable to move on herself. The show was able to cleverly combine humor with drama, as George reluctantly performed her reaper duties while trying to hold down her day job at a temp agency. George learns the way of the reaping undead from her fellow reapers, lead by taskmaster Rube, wonderfully played by Mandy Patinkin.